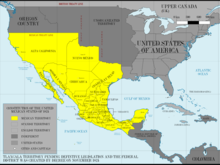 While the Mexican territory theoretically existed until the Mexican Cession under the Treaty of Guadalupe Hidalgo on February 2, 1848, the New Mexico Territory had been annexed under U.S. military occupation in September 1846, after the surrender by Mexican interim governor Juan Bautista Vigil y Alarid to General Stephen W. Kearny. Nuevo México was centered on the upper valley of the Rio Grande (Río Bravo del Norte): from the crossing point of Oñate on the river south of Ciudad Juárez, it extended north, encompassing an area that included most of the present-day U.S. state of New Mexico. It had variably defined borders, and included sections of present-day U.S. states: western Texas, southern Colorado, southwestern Kansas, and the Oklahoma panhandle. Actual Spanish settlements were centered at Santa Fe, and extended north to Taos pueblo and south to Albuquerque. Except for the first decade of the province's existence, its capital was in the foothills of the Sangre de Cristo Mountains at the ancient city of La Villa Real de la Santa Fe de San Francisco de Asís (modern day Santa Fe). The Nuevo México Province was created by Philip II of Spain and was officially settled during the 1598 expedition by Juan de Oñate, governor; he established the colonial settlement San Juan de los Caballeros near Ohkay Owingeh Pueblo. The expedition had been authorized by Philip II to survey the region. Though the Spanish believed that cities of gold such as the ones of the Aztecs, whom they had previously conquered, lay to the north in the unexplored territory, the major goal was to spread Catholicism. Other expeditions had taken place before Oñate's 1598 expedition. He was unable to find any riches, however. As governor, he mingled with the Pueblo people and was responsible for the establishment of Spanish rule in the area. Oñate served as the first governor of the Nuevo México Province from 1598 to 1610. He hoped to make it a separate viceroyalty from New Spain in an original agreement made in 1595, but the terms failed when the Viceroy changed hands in 1596. After a two-year delay and lengthy vetting by the new viceroy, Oñate was finally allowed to cross the Rio Grande River into modern day Texas and New Mexico. Most of the Spanish missions in Nuevo México were established during the early 17th century with varying degrees of success and failure, oftentimes building directly atop ancient pueblo ruins, and in the centers of pueblos. Some pueblos were friendly to the foreigners, but after cultural differences and the banishment of local religions tensions against the Spanish rose significantly. After compounding misdeeds and overbearing taxes by the Spanish invaders, the indigenous communities rebelled in what is now referred to as the Pueblo Revolt of 1680. This rebellion saw the Spanish expelled from Nuevo México for a period of 12 years and the pueblo people were able to regain lost lands. They returned to battle against the Spanish who sought restoration in 1692 of the conquered holdings. The reoccupation of Santa Fe was accomplished by Diego de Vargas. The province came under the jurisdiction of the Real Audiencia of Guadalajara, with oversight by the Viceroy of New Spain at Mexico City. In 1777, with the creation of the Commandancy General of the Provincias Internas, the Nuevo México Province was removed from the oversight of the Viceroy and placed solely in the jurisdiction of the Commandant General of the Provincias Internas. The province remained in Spanish control until Mexico's declaration of independence in 1821. Under the 1824 Constitution of Mexico, it became the federally administered Territory of New Mexico. The part of the former province east of the Rio Grande was claimed by the Republic of Texas which won its independence in 1836. This claim was disputed by Mexico. In 1841, the Texans sent the Texan Santa Fe Expedition, ostensibly for trade but with hopes of occupying the claimed area, but the expedition was captured by Mexican troops. The United States inherited the unenforced claim to the east bank with the Texas Annexation in 1845. The U.S. Army under Stephen Kearny occupied the territory in 1846 during the Mexican–American War, a provisional government was established, and Mexico recognized its loss to the United States in 1848 with the Mexican Cession in the Treaty of Guadalupe Hidalgo. Texas continued to claim the eastern part, but never succeeded in establishing control except in El Paso. However, in the Compromise of 1850 Texas accepted $10 million in exchange for its claim to areas within and north of the present boundaries of New Mexico and the Texas panhandle. President Zachary Taylor and Abraham Lincoln both proposed that New Mexico immediately become a state to sidestep political conflict over slavery in the territories. New Mexico did not become a state until January 1912. Wikimedia Commons has media related to Colonial New Mexico. ^ Stewart, George (2008) . Names on the Land: A Historical Account of Place-Naming in the United States. New York: NYRB Classics. pp. 23–24. ISBN 978-1-59017-273-5. There was Francisco de Ibarra, a great seeker after gold mines. In 1563 he went far to the north ... when he returned south, Ibarra boasted that he had discovered a New Mexico. Doubtless, like others, he stretched the tale, and certainly the land of which he told was well south of the one now so called. Yet men remembered the name Nuevo México, though not at first as that of the region which Coronado had once conquered. ^ Carroll, H. Bailey. "Texan Santa Fe Expedition". Handbook of Texas Online. Texas State Historical Association. Retrieved May 29, 2011. ^ Griffin, Roger A. "Compromise of 1850". Handbook of Texas Online. Texas State Historical Association. Retrieved June 7, 2012.